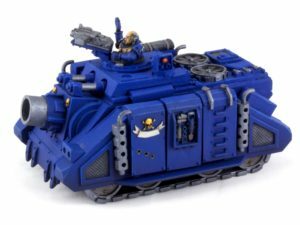 In honor of Tanksgiving, I present this Vindicator. This model would have been purchased in around 2000, during my third edition foray into Warhammer. Then it sat unpainted until around 2012 when I got back into the game. The kit is the old plastic Rhino kit with a substantial metal upgrade pack. The side armor consists of six separate panels, giving the model real heft. The figure sticking out of the top is a lot smaller than a standard marine, highlighting the inconsistent scale of vehicles and infantry.